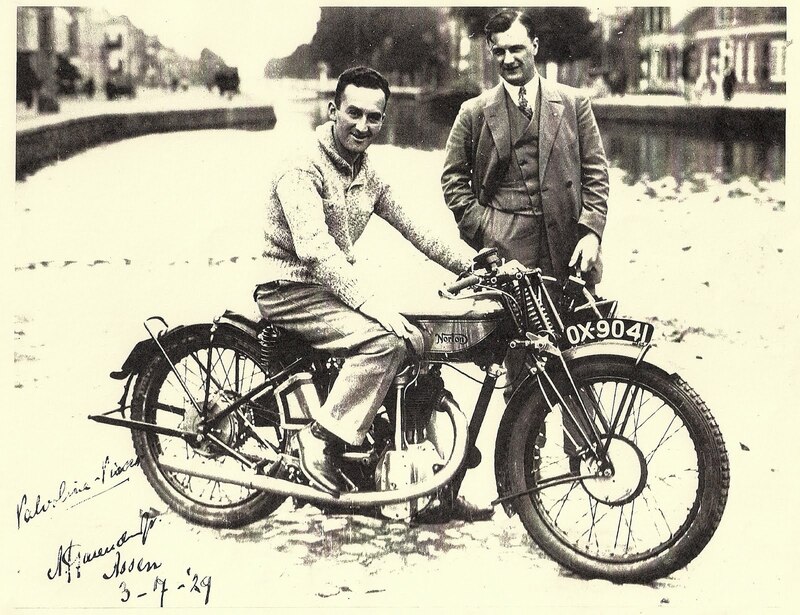 Here's Stanley at Assen in 1929 with the works Model CJ Norton. Looks like a publicity photo as one of the upper words is 'Valvoline.' Does anyone know who the chap is in the trendy waistcoat? A CJ with the same number plate (no proof it was the same bike!) was used in 1929/30 by Graham Goodman, one of the works trials riders and a very good one, by all accounts. He was - of all things - a manufacturer of pins and retired from trials at the end of 1932. The brakes are 7 inch back (Enfield) and front: the front seemingly like those used on the works CS1s at the time, made by HORTON. See this blog photo for a front view of this brake.The rear brake rod angle is a bit odd but you will find that most of the late twenties work bikes (like this one) had the brake arm on the rear brake pointing upwards while the standard CS1 and CJ machines had it pointing downwards. The other production saddle tank bikes (like the 1929 Model 18) had upward pointing brake arms. I have been told that the reason for the works bikes having the arm pointing upwards was simply that there was slightly less likelihood of locking the wheel with it mounted this way than when pointing downwards. If the front eight inch Enfield brake is anything to go by, it is not that good with the brake arm trailing (the standard set-up) and vastly improved by having it leading instead. The fork bump stops were made by Webbs and appear in their literature. They seems to have been used on most of the works Nortons in the late twenties/early thirties. Roger: "There is a very odd lug bolted on the front down-tube just below the steering head which looks silver in colour and I have no idea what that was for. Trial around 1930 were more long distance reliability trials than the mud plugging that became the standard after the war. I have some pictures of the AJS team at Brooklands at the end of the ISDT where the machines look more like Brooklands racers than trials bikes. I am not surprised that OX9041 was used for such trials, all that would be needed would be a different cam, carburation and a compression plate. Jimmie Simpson was still competing in trials on a Norton in the very early 30s"